Successfully Added Hesvit G1L Fitness Tracker Bracelet - Bluetooth 4.0, Pedometer, Distance Counter, Calories Burned, Heart Rate Monitor to your Shopping Cart. With the Hesvit G1L fitness tracker bracelet at your wrist, you’ll efficiently work towards a healthier future. Whether you wish to lose weight, gain muscle, or increase your cardio – this Bluetooth sports watch will guide you through the process. With an abundance of smart health and fitness features, it provides you with highly detailed and valuable health information. Based on this info, you’ll be able to adjust the intensity and duration of your workouts to reach the fastest possible results. It comes with a 60mAh battery that gets you through a weeks' worth of usage time. Therefore, you won’t have to worry about running out of juice in the middle of your workout. Thanks to its pedometer, you’ll be treated to accurate information on the number of steps you took throughout the day. Additionally, your fitness tracker bracelet lets you know the distance that you have covered and the calories burned in the process. From now on, you can be guaranteed that you’ll always meet your daily exercise levels. The bracelet itself has been crafted out of comfortable silicone rubber and features an IP65 waterproof design. Therefore, you’ll be able to use it in any weather condition. 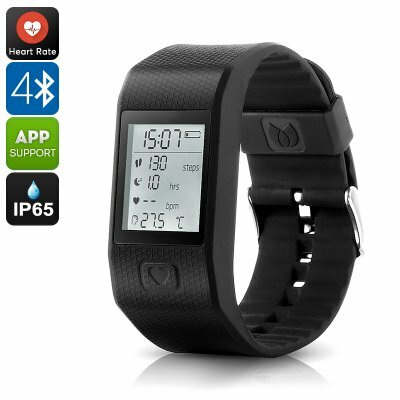 Besides its pedometer, your fitness gadget comes with a heart rate monitor, and skin temperature sensor. Together, these smart health features provide you with valuable info on your current health status. It furthermore comes with a sleep monitor that makes sure you’ll get enough rest in between your workouts. With its Bluetooth 4.0 support, you’ll be able to synchronize this Bluetooth watch with your iOS or Android smartphone. Once this has been done, you can receive incoming call notifications straight onto your wrist. Thanks to this, you’ll never miss out on an important update again. The Hesvit G1L fitness tracker bracelet comes with a 12 months warranty, brought to you by the leader in electronic devices as well as wholesale fitness gadgets..